Directions: Cut tomatoes into 10 wedges.Pare the cucumber; cut it in half lengthwise and then in thin slices. Cut onion in half lengthwise and then slice paper thin. 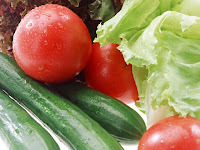 Rinse and pat dry.On a platter, arrange in succession rows of tomatoes,cucumber slices and onion pieces. Sprinkle with the dill, salt and chili pepper.Mix vinegar.